Arch dams are best suited to narrow canyons where they divert the force of the water behind the dam to the sides of the cavern in order to help support the weight. Therefore, arch dams need not be as thick as gravity dams since the dam itself supports less weight making them less expensive to construct. Arch dams may carry less weight than other dams, however, they are affected by the same kinds of force. These forces must be considered when building one, and include: pressure of the water, weight of the water, and weight of the dam. Dams hold back water, and a dam is no good if it can't hold back the water. Therefore, the pressure exerted by the water in the reservoir must be considered before building a dam. The force of the water pushing on the dam is proportional to the depth of the water contained behind the dam. So, as the depth increases, the pressure increase - at the bottom of the dam, pressure is highest. The weight of the water and the weight of the dam must be considered to ensure that the foundation can support the dam. The earth supporting the dam must be strong enough to support the weight of the dam. Therefore, the normal force (n) must be sufficient to support the weight (W) of the dam and the water. 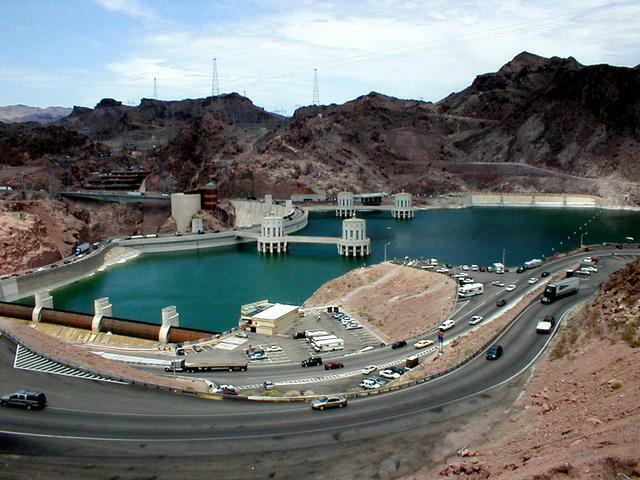 A well known example of an arch dam is Hoover Dam which sits in the Colorado River on the border of Nevada and Arizona. Dams are used to generate energy by harnessing the potential energy of water contained in the reservoir. For example, Glen Canyon Dam is 216m (710ft) high. At the bottom of the dam, the water passes over turbines that are used to convert mechanical energy to electrical energy.